Triad’s Jenna Ober throws to first for an out against Cuyahoga Heights on Friday. Ober was 1 for 2 with both RBI for the Cardinals. 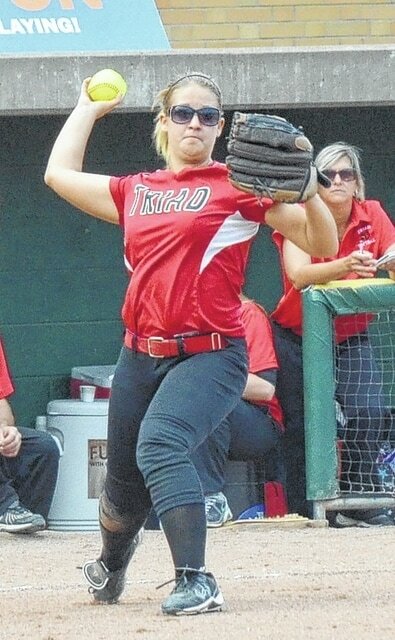 AKRON – Triad jumped out to a 2-0 lead and held on to beat defending champion Cuyahoga Heights, 2-1, in a Division IV state softball semifinal on Friday. The Cardinals wasted no time getting started in the bottom of the first inning, with Jenna Ober knocking in Jenna Welty and Hannah Watkins with a two-out double, putting Triad up 2-0. Ober has been hot lately, racking up hit after hit in the tournament. Watkins had a special moment in the top of the second inning, striking out the side for her 498th, 499th and 500th career strikeouts. She would go on to fan 8 for the game. In the third inning, Triad threatened with the bases loaded and one out, but was unable to capitalize. Cuyahoga Heights finally scored with a run in the fourth inning. With two on, a hard-hit single up the left side and an error by McKenzie Legge allowed a runner home with two outs. Watkins came back with a strikeout to end the inning. The Redskins threatened again with a double in the top of the fifth, but with runners at the corners and two outs, Cuyahoga Heights tried to advance the runner on first and draw a throw. The plan worked perfectly, except that Jenna Welty gunned her down with the throw and ended the inning. In the sixth, Legge atoned for her earlier error with a terrific catch at the wall and Watkins finished the inning with a strikeout. Time and again, the Redskins threatened – including in the seventh. But time and again, they were turned away. Madison Dolby made a great running, over-the-shoulder grab to finish off the game’s final out. Welty and Watkins each finished 2 for 3, as did Chelsea Price. Triad (26-3) plays Shadyside (21-5) at 7 p.m. in Saturday’s Division IV final. Shadyside outlasted New Riegel, 6-5, in 8 innings despite 4 errors with a 13-7 hitting edge in the other semifinal game.